Asian Medical Institute (ASMI) is a top medical america.html to study MBBS in Kyrgyzstan and an MCI approved Government University for medical studies. Asian Medical Institute is a B+ graded university offering low cost MBBS program for Indian students. The rector of this university Mr. Mamytov Mitalip Mamytovich has been working hard to ensure superb quality of low cost medical america.html in Kyrgyzstan and a safe experience for all the international students. This MBBS in Kyrgyzstan fee structure is the most suitable for all Indian students looking for low cost MCI approved medical programs. Asian Medical Institute is the leading higher medical institution of the Kyrgyz Republic. This university is providing a top MBBS in Kyrgyzstan. It is located just 45 minutes from the main International Airport at Bishkek, the capital city of Kyrgyz Republic. Asian Medical Institute was established with the official license by the ministry of education. It is also registered with ministry of health of Kyrgyz Republic as Registration number 1-184. ASMI is enlisted in world directory of medical schools published by WHO. This program is taught according to the medical system of European universities which enables Indian students to migrate for getting a job in any part of Europe upon completion of this low lost MBBS course. 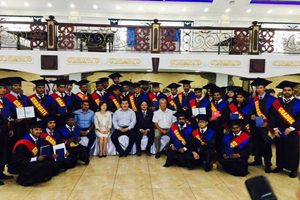 There are 5 MCI approved colleges in Kyrgyzstan and Asian is considered to be a top one. Asian Medical Institute is aimed to teach MBBS in Kyrgyzstan for Indian students entirely in the English Language. The selection of faculty has been made on the basis of highly English speaking doctors from different countries. The professors meet the educational requirements of students from any country including India according to their choice knowledge. The university is also popular because, at a fixed cost of US$ 100 (Rs. 6,500 per month), the Indian students studying MBBS in Kyrgyzstan are able to get the Indian food at the canteen. More than 6,000 students study medicine in Kyrgyzstan at Asian Medical Institute out of which around 15% are Indian students. The cost to study at Asian Medical Institute fee structure is already low and subsidized and there is no Scholarship available for the Indian students.